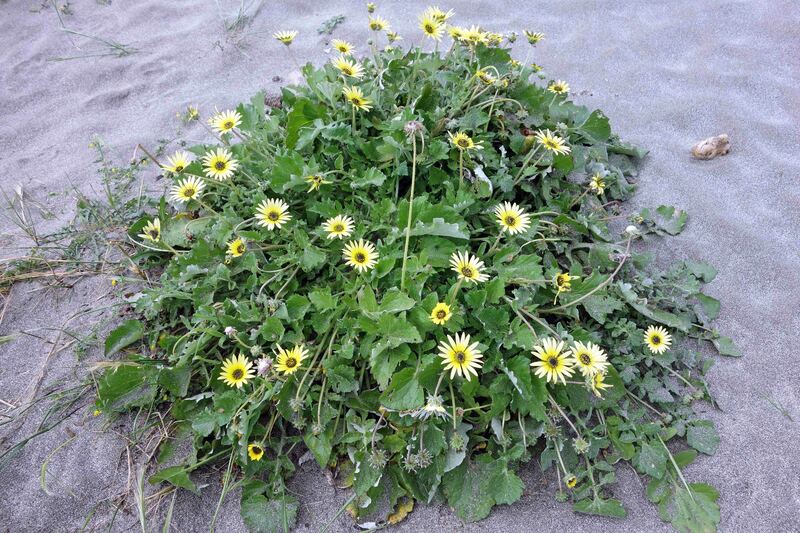 Seaside flowers: the good, the bad and the invasive! Arctotheca calendula flowers, Galicia, Spain. Arctotheca calendula is an attractive flowering aster known as cape weed, cape dandelion or cape marigold. It originates from South Africa where it widespread in coastal areas or on disturbed soil. It has however, spread right around the world, including around the Mediterranean. I came across it in northern Spain (Galicia), where all these pictures were taken. 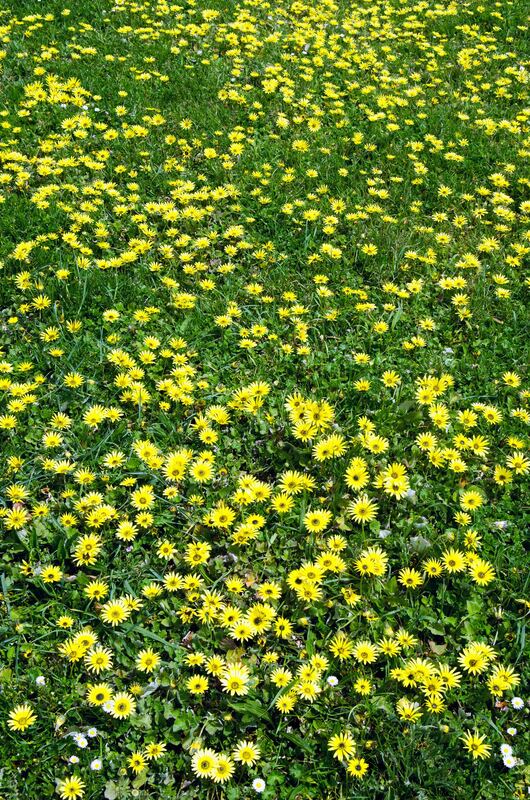 In many of the countries where it has spread to, A. calendula is seen a Noxious Weed (USA) or an Invasive Alien Plant (1); primarily, because it can infest turf and pasture and also because it can compete with economically important crops. It seems to have taken a special liking to Australia, where it has become naturalised, and very large infestations covering acres of land can be seen in southern, central and eastern regions of Australia (3). It has to be said, that it is doing quite well in NW Spain as well (see below), although most people seem to like and admire this plant when they come across it on the coast in Galicia. Judging by the number of people who take pictures of it whilst it is blooming. A field of Arctotheca calendula flowers growing near Cabo de Bares, Galicia, Spain. Despite being invasive, it is said not to compete well in natural – i.e. undisturbed ecosystems – or with native species, but when established, can have a moderate impact on native plant communities (2). I have however, seen it growing in grasslands, inland for the sea. Nevertheless, it is good at growing right at the margins of the beach, actually on the sand, where it does not seem to be competing with any other native plants, not even Marram grass. I came across this clump on Morouzos beach on the Ria Ortigueira.(https://rcannon992.com/2014/10/28/morouzos-beach-a-unique-and-fragile-dune-habitat/). It is present right along the north coast of Spain, from Galicia through Asturias and Cantabria and into the Basque Country (9). Arctotheca calendula clump on the beach at Morouzos, Ria Ortigueira, Galicia. 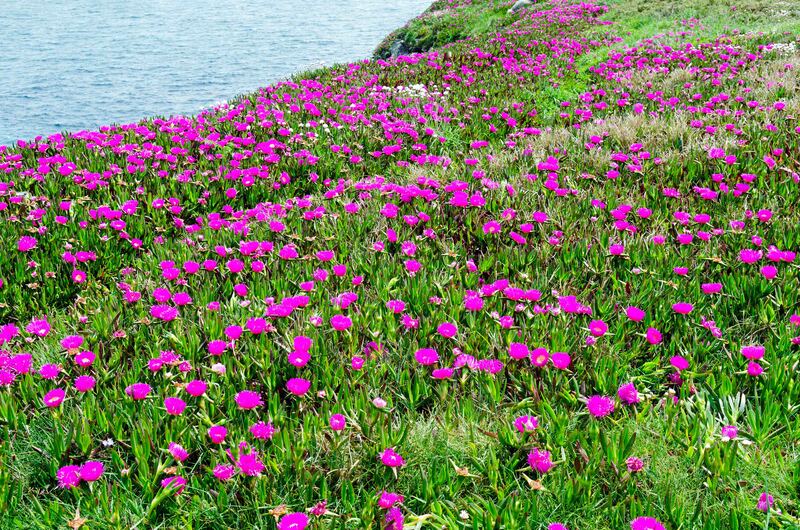 Carpobrotus edulis is another South African invasive with a long list of bad habits; it forms impenetrable mats which shut out native species and cause a reduction in the number of plant species. 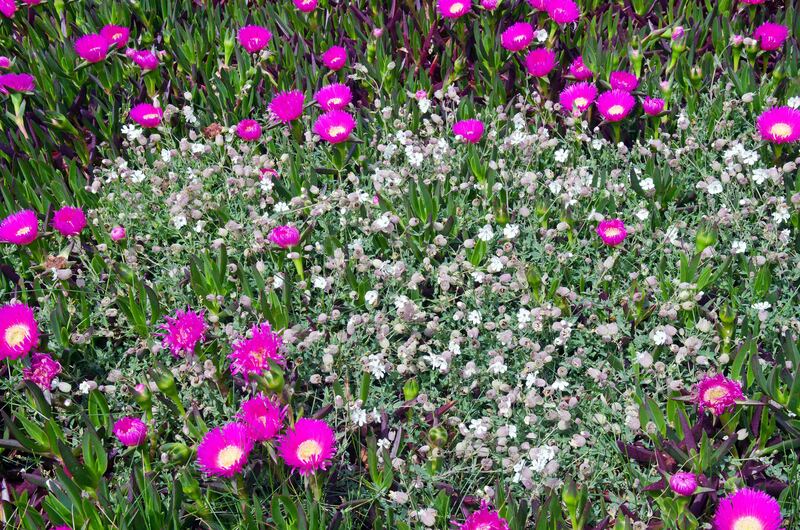 It is commonly known as the Hottentot fig, Cape fig, ice plant or pigface, the latter sounding more like an insult rather than a plant name! Confusingly, it also hybridises with another succulent in the same genus, C. acinaciformis, forming patches of the hybrid (hybrid complex known as C. affine acinaciformis) containing flowers of mixed colours (8). This succulent perennial is now distributed all round the Mediterranean and up along the Atlantic coasts of Portugal, Spain, France and the British Isles. It is particularly well suited to the conditions found on sand dunes and on sea cliffs. In Spain, it is called uña de gato (cat’s claw) which is a bit confusing as there are other plants around the world with this name. I am calling the plants in these photographs Carpobrotus edulis but they might be the hybrid, C. affine acinaciformis (see 10). Such hybridisation, can of course increase the vigour, and hence the invasiveness of such species. It is possible to remove this species by hand-pulling, but it would be an enormous under-taking which would have to be done on a regional basis to prevent re-invasion (10). Whilst it might be desirable, it is very hard to imagine that such a coordinated and costly undertaking would ever be carried out – particularly under present financial constraints – and given the fact that many people like these plants. It would involve a huge task of re-education of the public to the desirability of native flora over such mixed ecosystems. 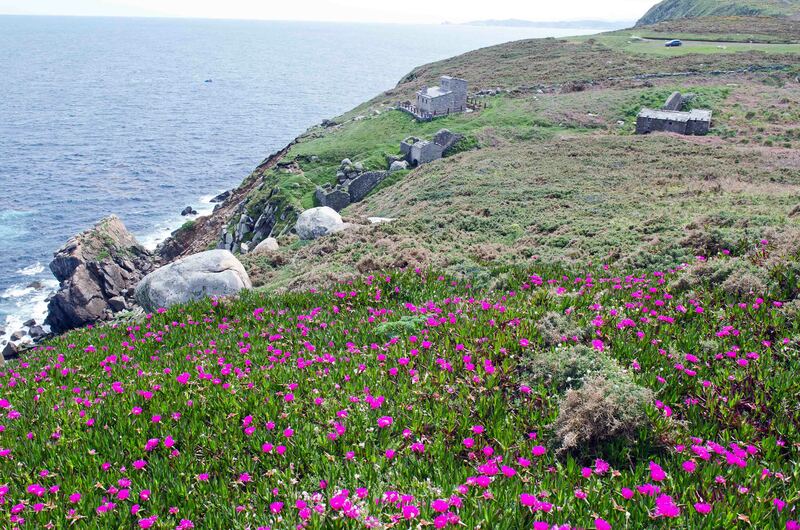 It would be nice to see more studies on the effects of this invasive on native species such as the sea pink, Armeria maritima (see photo below), or Bladder campion, Silene vulgaris (next photo down). What’s going on here? Are the native species co-existing with the invasives, or are they being squeezed out before our eyes? Despite being invasive, noxious and weedy (!) these plants are probably here to stay. There are simply too widespread and established to be eradicated. Additionally, they may have some benefits which have not been fully appreciated, despite their bad reputations! They are bright and colourful, and people certainly like them (unaware for the most part of their invasive natures). So, the questions we need to ask about these plants, is: are they all bad, or do they have some redeeming features?! The ‘costs’ of invasive organisms, plants and animals, are well documented, but the ‘benefits’ are less well understood. In areas where native species have been eliminated – i.e. are extinct – some invasive species have taken over the roles of the original natives. They have formed a ‘novel ecosystem’ (4). In many, if not most cases, it will not be possible to completely restore the original ecosystem – and we may not even wish to; we may prefer the new one! Or at least one that contains novel species but is under control (i.e. the native species remain). So, in cases such as this, where the stable door has been left wide open, so to speak, and the invasive species are highly established, we are probably going to have to work to manage and stabilise these novel ecosystems (6). 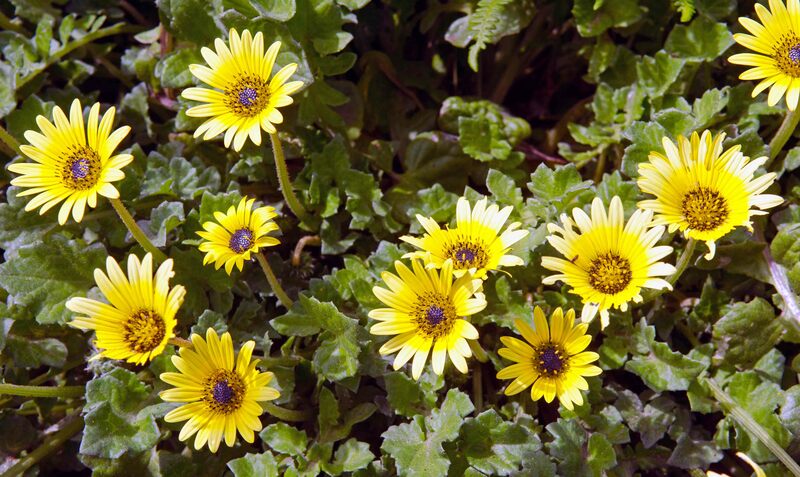 Many people, growing up with ‘invasives’, will probably not even know what the original habitat looked like, and would arguably miss their invasive species if they all disappeared, be they cape marigolds, cape figs or grey squirrels! It’s a complex world. We have altered these ecosystems for better or worse, and we now need to make some difficult choices. Go all out to eradicate the invasive species – a massive and costly undertaking – or try to manage them and minimise their impact on the native species we love as well. 4. Hobbs, Richard J., Eric Higgs, and James A. Harris. “Novel ecosystems: implications for conservation and restoration.” Trends in ecology & evolution24.11 (2009): 599-605. 9. Campos, Juan Antonio, et al. “The role of alien plants in the natural coastal vegetation in central-northern Spain.” Biodiversity & Conservation 13.12 (2004): 2275-2293. 10. Andreu, Jara, et al. 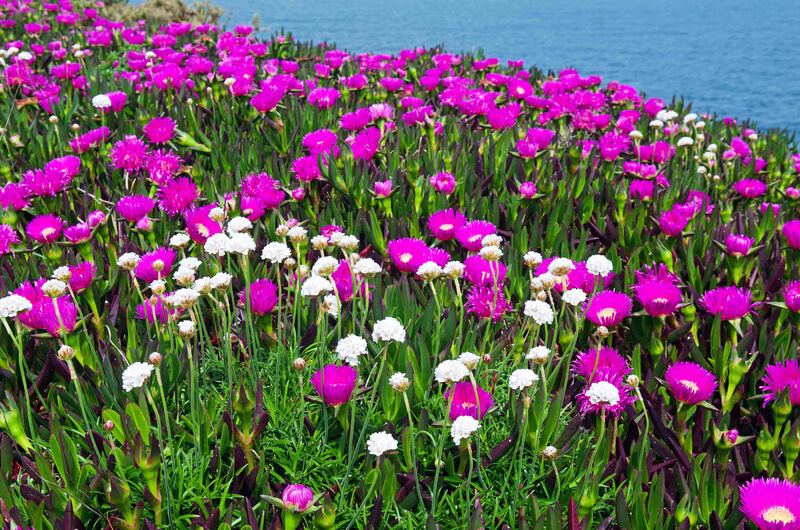 “Vegetation response after removal of the invasive Carpobrotus hybrid complex in Andalucía, Spain.” Ecological Restoration 28.4 (2010): 440-448. Next Next post: Seaside flowers: the good, the bad and the invasive! Ray Cannon's nature notes Seaside flowers: the good, the bad and the invasive!